Droid Razr HD is a Flagship Android device from Motorola. Powered by a 1.5 Ghz Krait Processor and Adreno 225 GPU, it can handle some high end games. Motorola introduced Droid Razr HD with Android 4.0.4 Ice Cream Sandwich and later updated to Android 4.1.2 Jelly Bean firmware recently. We are here with some Custom ROM that are programmed to bring some performance and battery enhancement to Droid Razr HD. 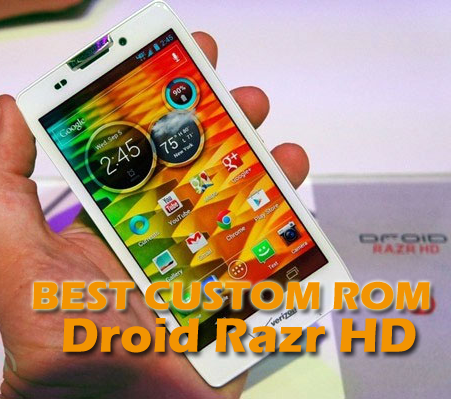 There are some best custom ROM for Droid Razr HD based on Android Jelly Bean firmware. Warning: Installing any custom ROM needs root access of your device. So, please proceed at your own risk. We will also not hold any responsibility for any of the consequences you face. Android 4.4 Kit Kat ROM for Droid Razr HD [CM11] : A recognized developer and XDA forum member, has launched a CM11 ANdroid 4.4 Kit Kat ROM rebuilds from the CyanogenMod for Droid Razor HD. This ROM is yet in testing mode but few people have reported the ROM to be stable with some minor bugs. The list of bugs has not appeared anywhere but the developer has already warned that this ROM is not daily driven. The developer is working to resolve the bugs and we may expect a full working Android Kit Kat ROM for Razr HD very soon. PacMan ROM for Droid Razr HD [CDMA/GSM]– Well, most of people who install custom rom knows about AOKP and Paranoid ROM. Pac Man ROM developer [XDA forum Senior member] has created this ROM based on latest AOSP Jelly Bean 4.2.2 firmware. But it has goodness of AOKP, Paranoid ROM and CyanogenMod. Pie Contol, Hybrid settings, per app layout, per app color are just preview features. There are lots of tweaks and most of the things are working. The ROM is available for both CDMA[XT926] and GSM[XT925] version of Droid Razr HD. The ROM is just 189MB, its light and fast. Try any of the ROM’s you like or even you can try of the ROM’s one-by-one mentioned in the article. Let us know if you have any queries, we are here for you always.